On September 12, 2017 Trappe Borough filed its MS4 Plan with the Pennsylvania Department of Environmental Protection (DEP). We expect some feedback from the DEP in early 2018. Trappe Borough has implemented SWIFT 911 as a service to borough residents. SWIFT 911 is a high speed notification program with the capability of delivering recorded messages to our community via telephone, email, text or pager. SWIFT 911 in its simplest form is a system that makes phone calls to specific people or areas in the event of an emergency or for sharing important community information. All the calls you receive will have the Caller ID of “Trappe Borough”. If you are not receiving these calls or have a non-published telephone number, please fill out the form below to add or update your contact information. You may also remove yourself from our lists with this form. The following streets were milled and overlaid in 2018: Ash St., Bonny Brook Ave., Center Ave., a portion of Cherry Ave., Holly Dr., Nicholas Ln., and Oak Rd. 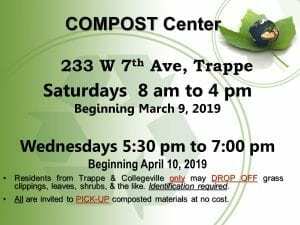 Trappe and Collegeville jointly purchased a property north of the W. 7th Ave. compost site for future storage of road salt, which is currently stored outside the Boroughs. Trappe Borough was awarded a $282,500 PA Green Light Go Grant to fund 80% of the cost to upgrade traffic and pedestrian signals on W. Main St. at both Rt. 113 and the Trappe Shopping Center. Subsequently Montgomery County also awarded Trappe Borough $31,600 for biking enhancements to the same intersections and general road resurfacing. Connor Whitson, a local college student and resident diligently worked to catalogue and scan more than 4,000 plot plans. These plans were previously stored in the basement of Trappe Borough Hall in no particular order. The physical and electronic copies are now accessed by Borough staff as needed for research purposes. The bargaining unit at Collegeville-Trappe Joint Public Works Department, Collegeville Borough and Trappe Borough ratified a four-year labor contract. A guide to Trappe Council meetings was created and will be provided at monthly Council meetings to help and encourage residents to participate in their local government. A public Spotted Lanternfly information session was held at Trappe Borough Hall in order to provide the latest information on how to cope with this invasive species. Drainage was improved at the Marion Dr. curve by replacing a deteriorated storm pipe with one of greater capacity in order to remove stormwater from the road more quickly. 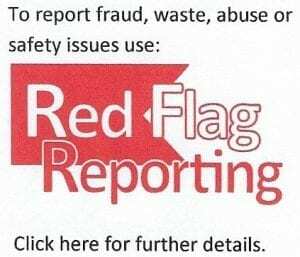 Council proactively instituted a Red Flag Reporting System to provide a hotline for the Confidential reporting of fraud, waste, abuse or safety issues related to Trappe Borough government. Council started providing a summary of Council meetings available on the website a few days after the meeting rather than waiting for the draft minutes to be posted. All of the above were accomplished without raising municipal real estate taxes. Trappe Borough maintains its status as having the third lowest municipal real estate tax in Montgomery County. As a business owner, we know you have a choice as to where you locate your business. Trappe’s elected Council officials want you to know we welcome business to Trappe. Many of us have spent a considerable time working in business so we have a keen appreciation for many of your challenges. We know and deeply appreciate that businesses create jobs and who among us doesn’t know that this is a major challenge of our times? Lastly, Trappe Borough Council has an unquestioned focus on continuous improvement. We certainly hope you locate your business in Trappe. In 2017 we completed our 300th anniversary and we look forward to working with you to make our community even better. Online access to official Trappe Borough documents is provided for the current year and the prior years . Copies of official Trappe Borough documents prior to this time frame are available at Trappe Borough Hall. Trappe Borough Council meets at Trappe Borough Hall on the first Tuesday of each month starting at 7:00 pm except when there is a conflict with a holiday or election day or a change in start time. Such schedule changes will be advertised and noted on the Trappe Borough website. The Trappe Borough Planning Commission meets at 7:00 p.m. on the third Tuesday of each month, as needed. Meetings are held at Trappe Borough Hall, 525 West Main Street, Trappe, PA 19426. Meetings are held the fourth Tuesday of each month at 7:00 p.m. During 2018 the meetings are held at Collegeville Borough Hall, 491 E. Main Street, Collegeville, PA 19426 after the Collegeville-Trappe Municipal Authority 7:00 p.m. meeting. Meetings are held the fourth Tuesday of each month at 7:00 p.m. During 2018 the meetings are held at Collegeville Borough Hall, 491 E. Main Street, Collegeville, PA 19426.. The Zoning Hearing Board meets on an as needed basis. Meetings are held at Trappe Borough Hall, 525 West Main Street, Trappe, PA 19426. Trappe Borough manages financial planning based on a long-term 5-year budget. Ordinance No. 416 was enacted on December 29, 2010, which ordained Trappe Borough to engage an independent auditing firm to prepare the annual audit of Trappe Borough’s financial records. To review the audit reports please click on the appropriate link below. Trappe Borough manages finances based on an annual financial statement. Ordinances become effective as of the date indicated on each Ordinance. The Ordinances below have been enacted by Borough Council and are all effective, however not all have been codified. Ordinance 442 and prior have been codified. Ordinances 443 and later have not been codified. The Borough of Trappe has a Road Maintenance Program whereby all Borough owned roads are on a multiyear maintenance schedule. Prior to repaving the underground storm sewers are videoed so any needed repairs can be identified. Public water and sewer infrastructure is also evaluated so any required work can also be completed prior to the final paving. Curb repair and maintenance is the responsibility of the property owner. (See, TBC §286-14). As the road maintenance work gets underway, property owners should know that if you have damaged curbs along your property repairs will need to be made. As a last resort, the Borough’s contractor will make the necessary repairs and the property owner will be invoiced for the repair work based on the bid price per linear foot of curb replacement. Questions About Your Tax Bills? If you have questions regarding your tax bills or tax payments please understand that the staff at Borough Hall does not have access to any tax information. You must contact the Tax Collector directly to get a tax duplicate, tax certification, tax receipts or to have any questions answered about tax payments. Gretchen Lawson is the Trappe Borough Tax Collector. The Tax Collector does not have an office at Borough Hall. However, the Tax Collector does have office hours from time to time. The hours are printed on the tax bill. Please note that tax certification and duplicate bill requests must be requested through the Tax Collector. Borough Hall staff does not have access to tax records and unfortunately we are not able to assist with these requests. The fee for up to a 4 year Tax Certification is $25.00. Tax certification includes County, Borough and School Real Estate. Please allow 5 business days for processing. Checks should be made payable to “Gretchen Lawson”. Requests should be emailed to trappetax@hotmail.com. Fee for Furnishing Information: There shall be a fee of $5.00 per year for furnishing and providing, by mail or otherwise, information pertaining to real estate tax data, where no tax certification is requested, including, but not limited to, tax duplicates, for any single tax parcel within the Borough of Trappe. As of January 1, 2013 Trappe Borough implemented a real estate tax of .47 mils. Portions of the total Real Estate Tax bill are delivered to Montgomery County and Perkiomen Valley School District, a portion does now remain with the Borough. The .47 mils Real Estate Tax that supports Trappe Borough is primarily used for road rehabilitation projects. Trappe Borough has a 1.4% Earned Income Tax (EIT) which is levied on wages and salaries of individuals who live in Trappe Borough. Perkiomen Valley School District receives .9% of this tax and Trappe Borough receives .5%. The Earned Income Tax is collected by Berkheimer Associates. Trappe Borough levies an annual $52.00 Local Services Tax (LST) from employees working in the Borough. The Local Services Tax is collected by Berkheimer Associates. All new and resale homes and businesses in the Borough of Trappe require a valid “Use & Occupancy Certificate” to be in possession of the new property owner before the structure may be inhabited or used as a business. The use must be approved as an allowed use in the zoning district and in order to make that determination a Zoning Use Application should be submitted with the U&O application. A general checklist of items that will be looked at during Use & Occupancy inspections is available at Borough Hall and on our website. PLEASE NOTE: If the person making application for a “Use & Occupancy Certificate” is not the current property owner, an “Owner’s Authorization” form bearing the property owner’s original signature must be included with the application. ONLY ORIGINAL SIGNATURES ACCEPTED – Forms that have anything other than the original signature of the property owner (i.e. faxed, e-mailed, or containing an e-signature) will be denied and returned for correction and re-submission. Failure to complete the process necessary to obtain a “Use & Occupancy Certificate” prior to settlement/taking possession of the structure can potentially have negative outcome as follows: (1) fines will be issued in accordance with the current year’s Fee Schedule; and (2) being served with a Cease and Desist Order requiring evacuation of the premises until a valid Use & Occupancy Certificate has been issued. The Zoning Hearing Board is a quasi-judicial body comprised of three members, all of whom are appointed by Borough Council and must be residents of Trappe Borough. The Zoning Hearing Board conducts legally binding hearings and renders decisions on appeals, variances, and special exceptions to the Borough’s Zoning Ordinance. The Zoning Hearing Board meets on an as needed basis. Meetings are held at Trappe Borough Hall, 525 West Main Street, Trappe, PA 19426. All building permit applications are reviewed by the Borough’s Zoning Officer. If the proposed project does not meet the requirements of the Borough Zoning Code, the Applicant will be referred to the Zoning Hearing Board to apply for a variance or special exception. The most common requests for variances are when a proposed addition exceeds allowable lot coverage or does not meet the setback requirements. All Zoning Hearing Board Applications to the Trappe Borough Zoning Hearing Board shall be made in writing on the Zoning Hearing Board Application form provided by Trappe Borough and shall be in accordance with the Trappe Borough Zoning Ordinance §340-82 and the Pennsylvania Municipalities Planning Code (herein called the MPC). The completed application, with all required fees, required site plans, property labels and with other required information, shall be submitted to the Zoning Officer. The Applicant is responsible to see that a Borough Official stamps the date of receipt on the Zoning Hearing Board Application. Under the provisions of the MPC §913.3 only a landowner or a tenant with written permission of the landowner shall file a Zoning Hearing Board Application with respect to a request for a variance and/or special exception. Other appeals may be filed with the Zoning Hearing Board under the MPC §913.3 by the landowner affected, the municipality or any person aggrieved. Application: Complete the Information Sheets (pages 2, 3 & 4), Application Narrative, Items 1, 2, 3 and 4 (pages 5, 6, 7 & 8), in their entirety. Please sign and date the application (page 8) and submit ten (10) complete copies to the Borough. All owner(s), current tenant(s) and/or occupants for all properties/lots located NOT on the same street but within a 150 foot radius, which would include properties in front, catty cornered and behind on all sides of the subject property/lot or building. Proof of Ownership:If the Applicant is owner of the property in question, please attach a copy of the Deed to the property; if the Applicant is owner of equitable title, or tenant with permission of owner of legal title, please attach proof of equitable ownership or lease. Owner’s Authorization:When an APPLICANT is NOT the owner of record, an “Owner Authorization” form must be completed by the OWNER(s), and the form with the owner’s original signature must be submitted with the application. Faxed forms are not acceptable. See, Owner Authorization form. *Under the provisions of the MPC §913.3 only a landowner or a tenant with written permission of the landowner shall file a Zoning Hearing Board Application with respect to a request for a variance and/or special exception. Other appeals may be filed with the Zoning Hearing Board under the MPC §913.3 by the landowner affected, the municipality or any person aggrieved. Application Fees:The permit fee must be submitted with the application. See the Trappe Borough Fee Schedule for application fees. Please note that the Fee Schedule is updated annually. Accordingly, please make sure you are using the current year Fee Schedule. Checks should be made payable to the “Borough of Trappe”. I. What is a Variance? A variance is a means of solving the problems created by attempting to apply the general terms of the Zoning Ordinance to fit the land which is regulated. It is necessary because a zoning requirement may prevent any use of a property if strictly applied. A variance procedure prevents problems in applying general legislation to specific situations. All Zoning Ordinances contain many detailed pre-set regulations designed to be self-executing. Various setbacks and height limitations are examples of these provisions, which omit administrative discretion. Variances act as means of possible a relief from the Zoning Ordinance. A request for a variance arises when an application for a zoning or building permit is rejected or “turned down” by the Zoning Officer because the proposed activity does not meet all the requirements of the Zoning Ordinance. The Applicant(s) would then make application to the Zoning Hearing Board for a variance as a result of this denial. The Zoning Hearing Board has the authority to vary the terms of the Zoning Ordinance in proper instances. Any person aggrieved by any decision of the Zoning Hearing Board, or any taxpayer, or any officer of the Borough, may within 30 days after any decision of the Zoning Hearing Board is rendered, appeal to the Court of Common Pleas of Montgomery County. All building and zoning permit applications are reviewed by the Borough’s Zoning Officer. If the proposed project does not meet the requirements of the Borough Zoning Code, the Applicant(s) will be referred to the Zoning Hearing Board to apply for a variance. The most common requests for variances are when a proposed addition exceeds allowable lot coverage or does not meet the setback requirements. (5) That the variance, if authorized will represent the minimum variance that will afford relief and will represent the least modification possible of the regulation in issue. In granting any variance, the Zoning Hearing Board may attach such reasonable conditions and safeguards as it may deem necessary to implement the purposes of the Zoning Ordinance. I. What is a Special Exception? A special exception is a use permitted within a zoning district, but subject to certain specific conditions. A special exception is a type of permission or approval granted an Applicant to use land in a district for a purpose other than that generally permitted outright in that district. The permission or special exception is granted by the Zoning Hearing Board in accordance with the standards contained in the Zoning Ordinance, provided that the specific application of the use would not prove injurious to the public interest. It is important to realize that the term “special exception” is a misnomer. It is neither special nor is it an exception. It is not a deviation from the Zoning Ordinance. An Applicant for a special exception is following the Zoning Ordinance. The application is one envisioned by the ordinance, and, if the standards established by the ordinance are met, the use is one permitted by the ordinance. Where the governing body, in the Zoning Ordinance, has stated special exceptions to be granted or denied by the board pursuant to express standards and criteria, the Zoning Hearing Board shall hear and decide requests for such special exceptions in accordance with such standards and criteria. In granting a special exception, the Zoning Hearing Board may attach such reasonable conditions and safeguards, in addition to those expressed in the ordinance, as it may deem necessary to implement the purposes of this act and the Zoning Ordinance. Where a permitted use is authorized pursuant to the jurisdiction of the Zoning Hearing Board of the Borough of Trappe, the Zoning Hearing Board is empowered to grant permission for “special exceptions,” consistent with the public interest, in specifically considering the standards in TBC §340-116 A – J, which standards must be met, where applicable, with the Applicant(s) having the burden of proof. All Applicants shall pay to Trappe Borough the required fee in accordance with the Fee Schedule which is approved and adopted by Resolution by the Trappe Borough Council. Please see the current year Fee Schedule for the fee amount. The Fee Schedule is updated annually. Please be sure to use the current year Fee Schedule. Checks should be made payable to the BOROUGH of TRAPPE. The Zoning Hearing Board meets on demand at Borough Hall, 525 W. Main Street, Trappe, PA 19426. Notice of hearing shall be given in accordance with the Zoning Ordinance §340-91 and the PA Municipalities Planning Code §908. A complete application requires that all fees are paid, site plans comply with all regulations with all appropriate submission procedures and relevant sections of the Zoning Hearing Board Application are fully completed. All materials must be received at the time of submission. If an application is not fully completed, the application will not be accepted. Publish a Notice of the Public Hearing twice in a local newspaper of general circulation. Serve written notice to the Applicant(s) by U.S.P.S. regular first-class mail. Serve written notice to the Borough by U.S.P.S. regular first-class mail. Serve notice to all property owners within 500 feet on the same street as the subject property will be provided by the Borough; and, notice to all property owners within a 150 foot radius of the subject property, not on the same street, will be provided by the Borough using labels submitted by Applicant(s) along with the ZHB Application. All notices sent by the Borough to these property owners shall be by U.S.P.S. regular first-class mail. In addition, notice of such hearing shall be conspicuously posted on the affected tract of land by Trappe Borough a minimum of seven (7) days before the hearing. The Applicant(s) is responsible for the maintenance of the notice. If the notice is removed or destroyed, the property owner must immediately obtain another notice and conspicuously post it. [MPC §908(1)]. The Zoning Hearing Board is permitted forty-five (45) days to render a written decision following the last hearing. A signed copy of the written decision will be sent by certified mailed to the Applicant(s) no later than the day following its date of execution. Please note: As required by the MPC, Building and Zoning Permits cannot be issued until the written Decision is received by the Applicant(s) and the Borough of Trappe. Applicant(s) shall have a right of appeal to the Court of Common Pleas of Montgomery County within thirty (30) days after the entry of the decision, or, in case of a deemed decision, within 30 days after the date upon which notice of said deemed decision is given as set forth in Section 908(9) of the MPC. The Zoning Officer must administer the Zoning Ordinance by its literal terms: the Zoning Officer does not have any discretionary power and/or authority to waive, tighten nor create any requirement for any Trappe Borough Ordinance. Occasionally, the Zoning Officer in his or her capacity cannot make a literal determination of the particular zoning ordinance in which the Applicant requires a decision. The Zoning Officer is then required by the MPC to refer this determination to the Zoning Hearing Board for decision. If you require property information such as tax parcel numbers, tax map, sales data, lot dimensions and size, sketch plan of a home, ownership records for properties within 500 feet or assessment records for properties in Trappe Borough, please click here. Borough Council meets at 7:00 p.m. on the first Tuesday of each month. In months when the regularly scheduled meeting is in conflict with a holiday, the meeting is held on the second Tuesday. Meetings are held at Trappe Borough Hall, 525 West Main Street. 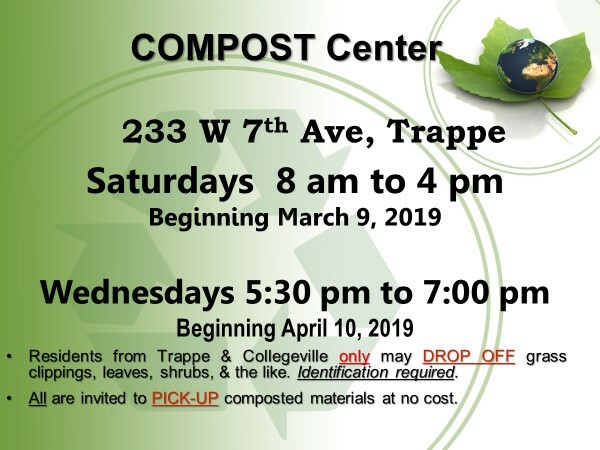 Meetings are held the fourth Tuesday of each month at 7:00 p.m. During 2019, the meetings are held at Trappe Borough Hall after the Collegeville-Trappe Municipal Authority 7:00 p.m. meeting. Meetings are held the fourth Tuesday of each month at 7:00 p.m. During 2019 the meetings are held at Trappe Borough Hall. The Central Perkiomen Valley Regional Planning Commission meets as needed on the following Mondays in 2018: January 21, March 18, May 20, July 15, September 16 & November 18. The location of the monthly meetings alternates between the member municipalities on an annual basis. In 2019, meetings are held at the Trappe Borough Hall at 7:00 p.m. Please click here for access to the Central Perkiomen Valley Regional Planning Commission website: Central Perkiomen Valley Regional Planning Commission. All Applications can be completed online, but cannot be submitted online. Applications require original signatures and payment to be accepted for submission. Most changes that a property owner might wish to make to a building or other structure will require a permit and inspections to ensure safe construction. Inspections are conducted pursuant to the PA Uniform Construction Code which was adopted by Borough Council in 2004 (ref. Borough Code §135 Article VI). See individual Building Permit Applications for details. All Plumbers are required to register with the Borough, even if you are already registered with the State. Without a valid Trappe Borough Plumber Registration you will not be permitted to do plumbing work in the Borough. Please complete the Plumber’s Registration below in its entirety and submit it to the Borough with the applicable fee. If all is in order you will be issued a Trappe Borough Plumber Registration within 48 hours. Trappe Borough requires any person, entity or organization who wishes to engage in the selling, soliciting or peddling of goods, food, services and/or printed matter within the Borough of Trappe must first obtain a Solicitation Permit. An organization must apply for one permit for each individual soliciting in the Borough. Each individual must apply for a Solicitation Permit in person and provide a valid form of picture identification. You are required to carry your Solicitation Permit at all times and exhibit it upon request to any peace officer or any person upon whom you make contact. The hours of solicitation in Trappe Borough are between 10:30 a.m. and 8:00 pm. Please complete the Solicitation Permit Application below in its entirety and submit it in person along with your fee to the Borough. Zoning Permits are in place to “promote the health, safety, morals and the general welfare of the Borough in accordance with a comprehensive plan … and to encourage the most appropriate use of land throughout the Borough.” Please refer to Trappe Borough Code §340.80-82 for detailed Zoning Permit information. See individual Zoning Permit Applications for details. You may engage the Borough Engineer, Borough Solicitor, Zoning Officer and/or the Building Code Official to review your plans. If you would like to have your plans reviewed prior to your plan submission, or if you would like to meet with any of the above professionals to discuss a potential project, you will need to submit a Professional Services Application and Escrow Agreement and set up the escrow funds. All fees associated with your plan review and/or meetings with any or all of the above mentioned Borough professionals will be paid out of your escrow funds. Please make certain you submit all required documents with your application. If you are submitting single lot construction plans for review, you will need to fill out the Single Lot New Construction Application for Plan Review and Escrow Agreement below and set up your escrow funds. All fees associated with your plan review from and or all of the above mentioned Borough professionals will be paid out of your escrow funds. You must submit all required documents with your application. If your project includes more than one lot being developed, please go to the Subdivision and Land Development section. An overlay district is a district superimposed upon another district which supersedes, modifies or supple¬ments the underlying regulations. Overlay zoning is a regulatory tool that creates a special zoning district, placed over an existing base zone(s), which identiﬁes special provisions in addition to those in the underlying base zone. The overlay district can share common boundaries with the base zone or cut across base zone boundaries. Regulations or incentives are attached to the overlay district to protect a speciﬁc resource or guide development within a special area. Common requirements may include building setbacks, density standards, lot sizes, impervious surface reduction and vegetation and landscape buffering requirements. Structure requirements could include building ﬂoor height minimums and ﬂood-prooﬁng to high water level. Trappe Borough conducts regular inspections of residential rental units. The foremost goal of this program is public safety, helping to ensure that apartments and other rental units are maintained in accordance with current building and property codes. In addition to safeguarding residents living in rental units, the program will help to protect property values throughout the Borough. Rental properties not subject to regular inspections are more likely to deteriorate over time. Neglected properties, in turn, lower the value of neighboring homes. Prior to the adoption of the program, rental units in the Borough were only inspected when a rental property changed ownership. And because some rental properties can be held by the same corporation or individual for several decades, rental units could go many years without an inspection. Now, rental units will be inspected every time there is a change of tenants, or every three years, whichever occurs first. Owners of rental properties created after January 1, 2009 will pay a one-time registration fee of $100 per property. To register your property, please use the Rental Property Registration. After the rental property is registered, each rental unit must pass inspection. Inspections are scheduled with a Rental Inspection Checklist. A general list of items that will be looked at during Residential Rental inspections is available at Borough Hall and/or on our website located with other Residential Rental documents. A complete copy of the rental inspection ordinance can be found here. Rental property owners who have questions about the rental inspection program are encouraged to contact Borough Hall at 610-489-7181. A Rental Inspection Checklist of items that the inspector will be looking at during a residential rental inspection is available below for your reference. IMPORTANT NOTE: On or before April 1st of each year property owners and/or managers must submit a completed “Annual Tenancy Report” to the Borough for each Residential Rental Property owned. There is no fee due for this. The form is available below and may be faxed, emailed, or sent via US mail. Resolutions are passed by a majority vote of Borough Council at their monthly public meetings as necessary. Online access to Trappe Borough Resolutions is provided for the current year and the prior three (3) calendar years. Copies of official Trappe Borough documents prior to this time frame are available at Trappe Borough Hall. www.advanceddisposal.com Trash & Recycling Collection. Bulk Trash. Christmas Tree Collection. Phone: 610. 489.2831 Water service provider. Phone: 610. 489.2831 Sewer service provider. and ambulance service DIAL 911. What is considered Public Information? In accordance with the Pennsylvania Right-to-Know Law (Act 3 of 2008) all records maintained by Trappe Borough are public records, unless the records are (a) specifically exempted by Section 708 of Act 3, (b) exempted by another state or Federal law, and/or (c) exempted by a judicial decree or order. To request a public record complete a Right-to-Know Request Form, and submit this to the Borough’s Open Records Officer. Requests for information may likewise be directed to the Open Records Officer via e-mail, fax or telephone, or the request may be delivered to Borough Hall. But please note: while the Borough may fill anonymous or verbal requests for information, relief and remedies under the Act are available to only to persons submitting a written request for information. What Happens After I Submit A Request For Public Information? All requests for information are filled in accordance with the Pennsylvania Right-to-Know Law (Act 3 of 2008). Most notably, a response to each request will be provided within five business days of the filing of the request. And if a request is denied by the Open Records Officer, a reason(s) for the denial will be provided, with information on how to appeal the decision of the Open Records Officer. The Borough does not charge a fee to locate the public information (i.e., employee time), but the Borough does charge nominal duplication fees as approved by the Pennsylvania Office of Open Records. In addition, the Borough charges actual postage fees if the public information is mailed to the requestor. Per the Act, the Borough reserves the right to require pre-payment of fees when fees are estimated to exceed $100.00. The Borough reserves the right to waive any fee. The Office of Open Records may be contacted by telephone at 717-346-9903, or by e-mail at OpenRecords@state.pa.us.